There are plenty of yummy things you can eat while still maintaining protein and carb ratios for maintenance or weight loss. The problem is they all contain veggies and lean protein and preparing these items mid day can be a challenge. That’s why a big batch of Cashew Chicken Salad is a great idea for weekday lunches! If you take the time on Sunday to combine a bunch of yummy healthy flavors you can have a whole foods quality grab-and-go lunch in your own fridge! Saves money and calories if you do it yourself! Coat chicken in olive oil and sprinkle with salt and pepper. Bake chicken for 40 min at 350 degrees, set aside let cool then chop into fine bite size pieces. Cook Quinoa (usually has 15 min cooking time). Set aside and cool. 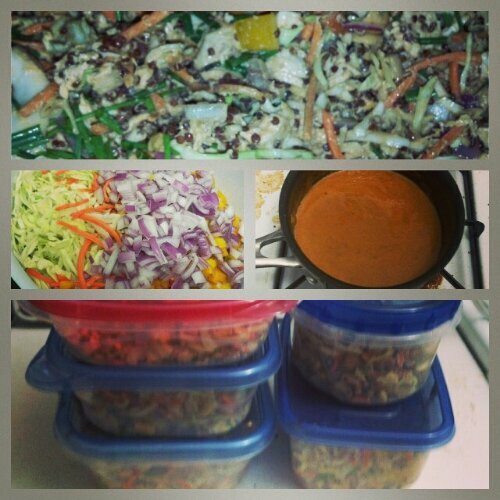 Chop and combine cabbage, carrots, red onion, green onion, and pepper. Prepare dressing by sauteeing sesame oil, peanut butter, ginger soy sauce, and apple cider vinegar over low heat. Add water for desire consistency. Pour dressing into mixture stirring until evenly distributed. Yummy recipe. I’ll have to make it. I am guessing it’s best to keep dressing on the side until ready to eat so the salad keeps better? You could, I put it on right away and it has kept so far for 3 days.